Sprinter Tyrone Edgar says Usain Bolt, who smashed the 100m and 200m world records on his way to Olympic gold, will not be untouchable in 2009. 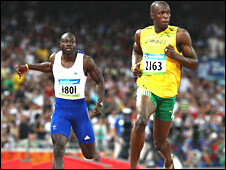 Edgar was the only Briton to reach the Olympic 100m semi-finals in Beijing where he ran in the lane next to Bolt. "What he did was a breakthrough. He's moved the sport way past what it should be," Edgar, 26, told BBC Sport. "But I don't think that anyone is untouchable. He is beatable but who would do that? I just don't know." Bolt stunned the athletics world in Beijing by setting a new 100m world record of 9.69 seconds, despite easing down to start his celebrations before he had crossed line. 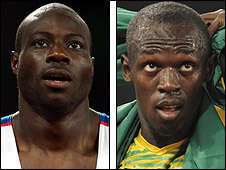 Four days later, the 22-year-old Jamaican smashed Michael Johnson's 200m world record, setting a new mark of 19.30 secs. He then went on to capture a third gold and third world record as Jamaica claimed the 4x100m relay in 37.10 secs. Bolt, who claimed the BBC Sports Personality's Overseas Personality award at the weekend, has also been named as 2008's "Champion of Champions" by French daily sports newspaper L'Equipe - ahead of Olympic swimmer Michael Phelps and tennis star Rafael Nadal. The Jamaican says he intends to lower his 100m and 200m times even further and has also set his sights on the 400m. Edgar says Bolt has raised the bar for sprinting, but has also made himself an obvious target for other sprinters to chase down. "It is scary for us athletes because no-one has gone under 9.70 before and he's the first athlete to run 19.30," said the Londoner, who was competing in his first Olympics. "But it's not disheartening; before Usain, Asafa (Powell) was running 9.7 or 9.8 so if are disheartened what are you doing in the sport? "If there is someone out there who is better and faster than you then you just have to train harder to be up there with him." How fast do you think Usain Bolt can go? Edgar says he and fellow British sprinter Simeon Williamson, who reached the 100m quarter-finals in Beijing, have already discussed how to respond positively to Bolt's achievements. "When I sit down with Simeon and talk about it we tell ourselves all the time we have to step our game up," added Edgar. "We take (Usain's achievements) as a positive to really start putting in 110%. I don't want to be left behind." Former Olympic sprinter Jason Gardener, one of only three Britons to break the 10-second barrier, said after watching Bolt's performances in Beijing: "I fear for young British sprinters, just how can they expect to compete?" Edgar, the best of Britain's Olympic sprinters, finished 2008 ranked 29th in the world. But he insists he and his domestic rivals Williamson, Craig Pickering, Mark Lewis-Francis, Harry Aikines-Aryeetey and the returning Dwain Chambers intend to push each other on in an attempt to get close to Bolt next season. "When someone steps their game up, someone down the line will do too," Edgar said. "At this point 10.0 secs is our best performance [in Britain last season] but we need to get to a point where 10.0 is just OK for us. "It's difficult, but none of us are training out there thinking we just want to be British number one - we have to set our aims higher." Edgar, whose season was interrupted by an injury, set a new personal best of 10.06 secs last May. But his coach Darrell Smith, who he trains with in Los Angeles, said he had expected the 26-year-old to go even fastest. "I thought he should have gone under 10 seconds," Smith commented. "But he wasn't always patient." Edgar agrees: "I knew that I could run 10.0 secs - that was my biggest goal but I didn't compete. "Can I break 10 seconds? Yes, very much so and next year I plan to do it. I'm very confident." Report: Bolt is crowned "Champion of Champions"